If you’re wondering whether large family-type farmers can kick the chemical habit and still grow plenty of food profitably, you should see the three organic operations just north of State 33 near Fremont in eastern Nebraska. These up-to-date farms cover more than 1,300 acres of some of the most productive land on the Platte River. They have been farmed without chemicals since the late 1960s by Ralf Rolfs, Del and Van Akerlund, and K.C. Livermore. In addition to producing good crops, they save energy. Less gasoline and diesel fuel are needed to power tractors in fields that work easier and less propane is needed to dry corn artificially. Besides that, there’s the natural gas that isn’t used to manufacture anhydrous ammonia and other agricultural chemicals for these farms. Any doubts these farmers had when they decided to make this abrupt switch (all admit they had some) are forgotten. They are anxious to share their experiences and have the kind of enthusiasm that even a farm chemical salesman would find hard to resist. Important in these operations is a four-year crop rotation that includes two years of corn, one of soybeans, and one of oats with a legume such as sweet clover or hairy vetch. The soybeans and legume crops “fix” nitrogen from the air, adding this natural plant food to the soil, and the legumes also provide green manure to be turned under. Rotating crops also prevents a buildup of corn rootworms, borers, and other pests that cause serious problems for farmers who do continuous cropping and rely on chemicals to control pests. All three farmers have some difficulty finding organic markets for their grain and livestock. They have discovered, however, that they get good yields consistently and don’t need special organic outlets or premiums to operate profitably. Both Rolfs and the Akerlunds have sold corn to a Primrose, Nebraska, cattle feeder who produces organic beef. The Akerlunds usually buy calves to feed out. But their lots are empty now due to low beef prices. Livermore has a steady list of customers who place orders for the 40 to 50 calves he fattens each year on organically-grown grain. He has stock cows to provide calves for this part of his operation and to utilize roughage on the farm. He also has some sheep. The economics of farming without chemicals is an eye-opener. While corn farmers spend up to $50 an acre for chemicals, and sometimes even more, it requires only a fraction of that for an organic farmer’s purchased inputs. Livermore reports his per acre costs since he quit chemicals have averaged about $8 a year. That covers soil conditioners and additives and a liquid fish fertilizer. He also has manure from his livestock operation to spread on the land. 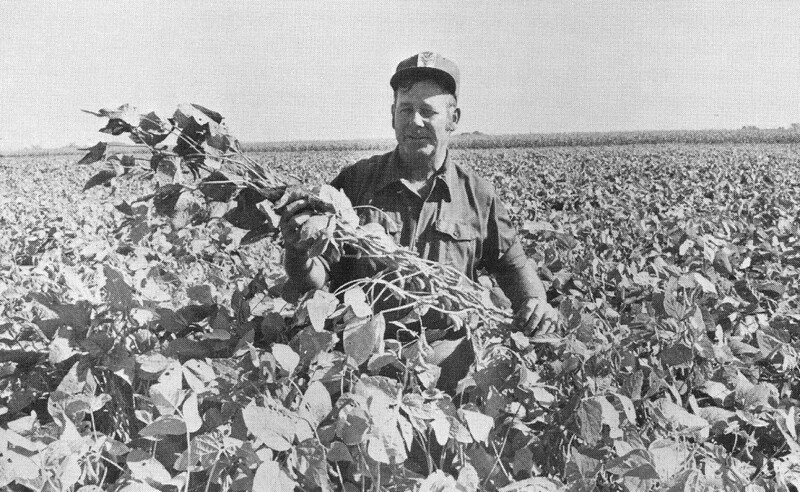 Livermore’s soybeans yielded more than 50 bushels an acre in 1973 while adjacent fields, given the full chemical treatment, were weed infested and yielded only about half as much. Rolfs said he never spends more than $10-12 an acre for purchased natural products on his cropland. 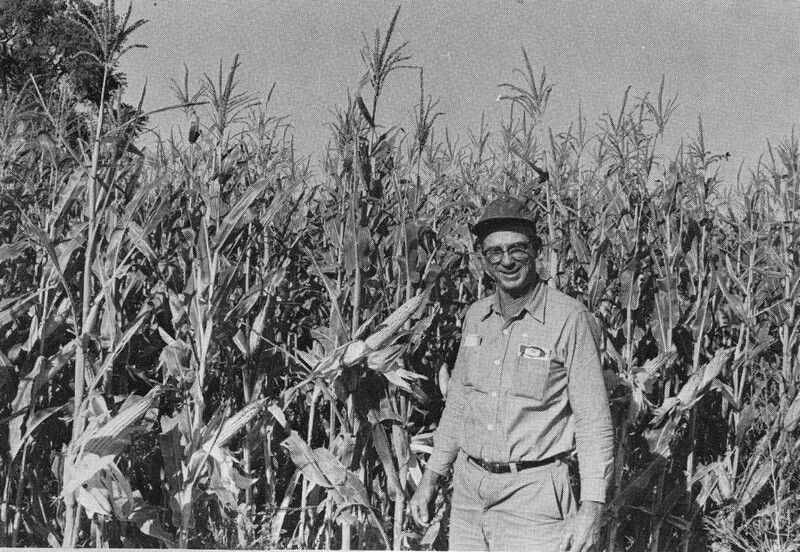 He said the biggest corn crop he had on his home 80, using the full range of farm chemicals, was 130 bushels per acre. 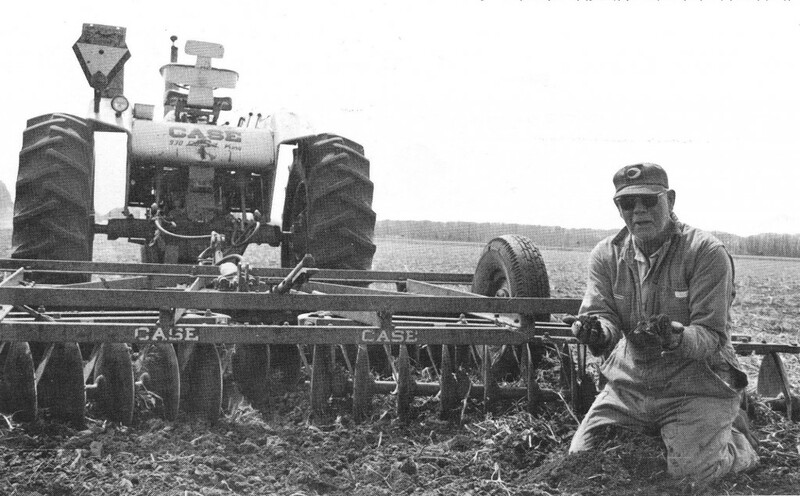 In 1973 with less than $12 an acre spent for natural fertilizers, he said, his corn on the same land averaged 120 bushels. How about weeds? Can a farmer get along without herbicides when weeds are a constant problem even to those who use all the latest chemical weed killers? Livermore says commercial fertilizers feed the weeds as well as the crops and reports his fields and those farmed by Rolfs and the Ajkerlunds are cleaner than those of their neighbors who use weed killers. “We don’t have the weed problems we had when we were using chemicals,” he declares. “When we dropped chemicals, we found the weeds didn’t grow as fast as the crops did. And so, with our power equipment and the speed we have on tractors, it isn’t hard to control weeds without chemicals. The message is that it pays to be a good farmer, killing weeds with good practices rather than trying to poison them. “I like to go over the corn twice with a rotary hoe, and then twice with a rolling cultivator,” Del Akerlund says. How about the energy savings and its implications for the future of American agriculture? Akerlund points out that experience on their 760-acre farm shows they have been able to cut back in terms of power requirements. Although the Akerlunds still dry corn in the fall, they bring it down to only 15 percent moisture. A lot of people, Del Akerlund says, contend you can’t keep that kind of corn in large bins for long periods of time. Akerlund feels more should be done to develop corn that ripens in the field so farmers won’t have to invest in drying equipment and pay high prices for propane. Livermore picks his corn instead of combining it in the field and ends up with several thousand bushels of ear corn. He doesn’t have any drying equipment and says he feeds livestock from the crib year-around without any spoilage. Organic farmers like to talk about their soil and to pick it up by the handfuls, smell it, and lovingly run it through their fingers. All three of these farmers decided to drop chemicals after visiting some organic farms in Iowa. Livermore admits he was a little skeptical. I love this story! It so well articulates the benefits of organic systems and the fact that this is what these farmers were saying in the 70’s when they were only four years into organic systems. It would be great to hear what they have to say now if they are still farming. Thanks for posting these on the web!